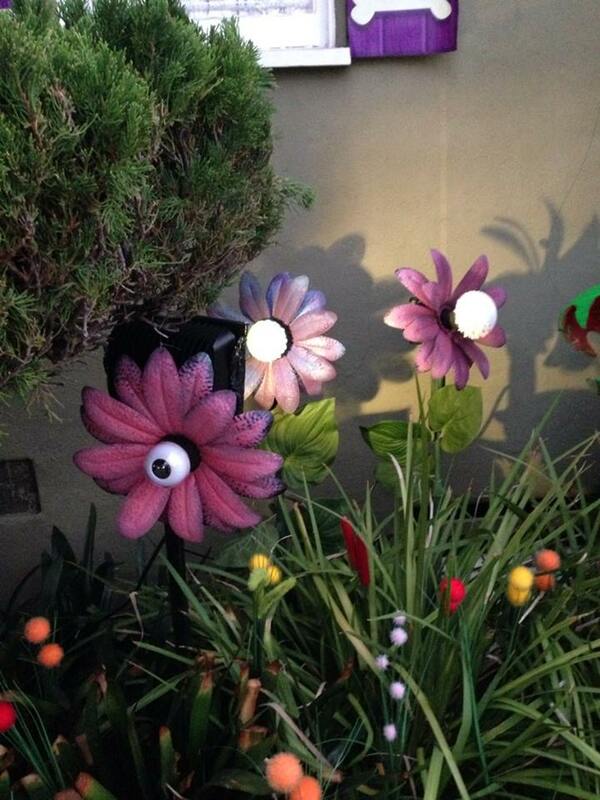 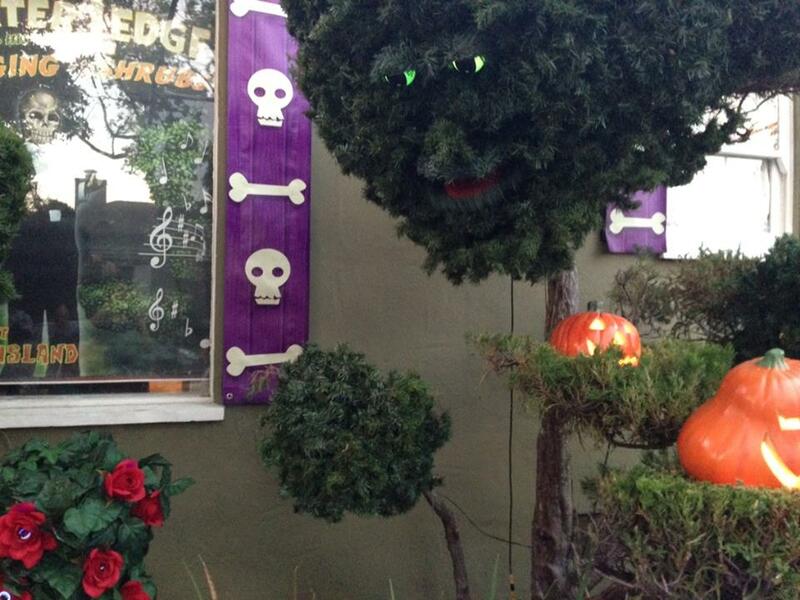 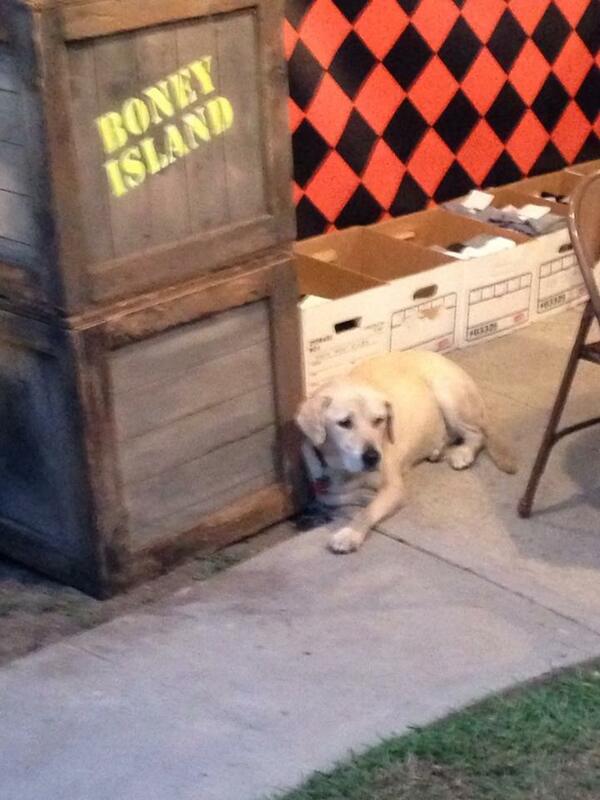 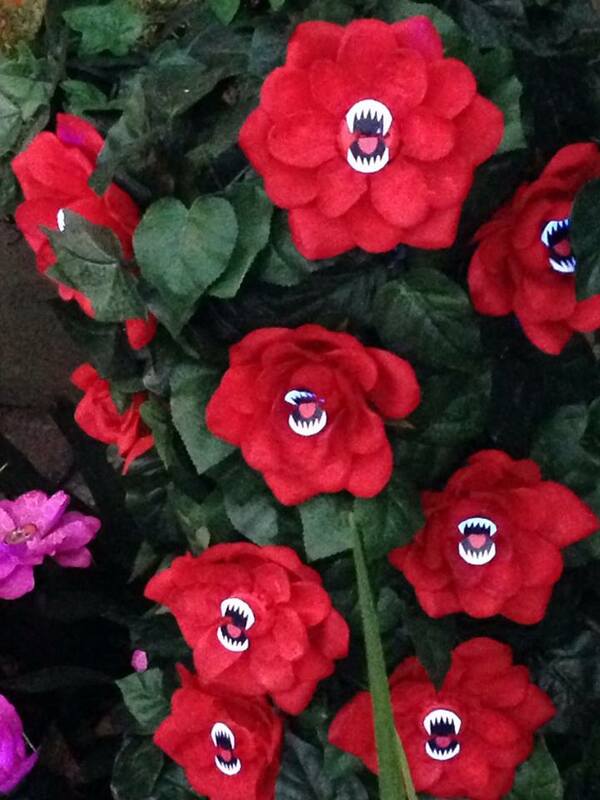 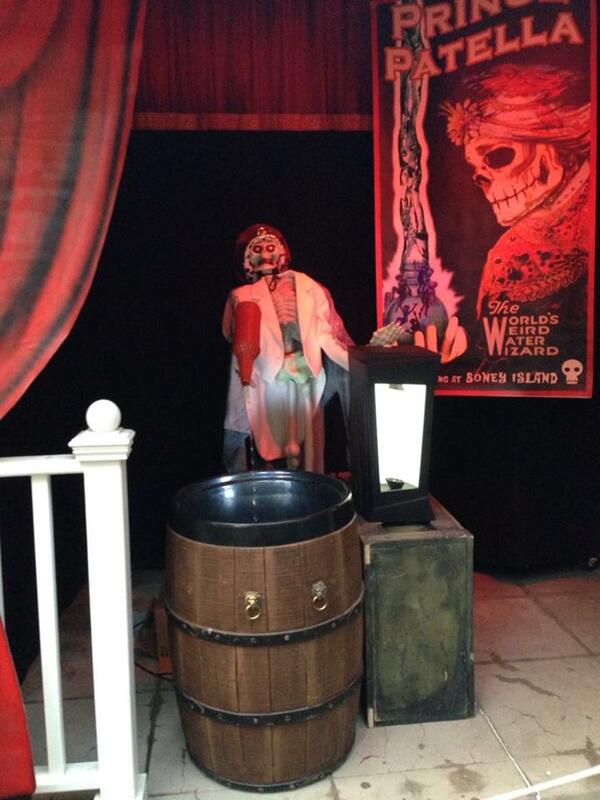 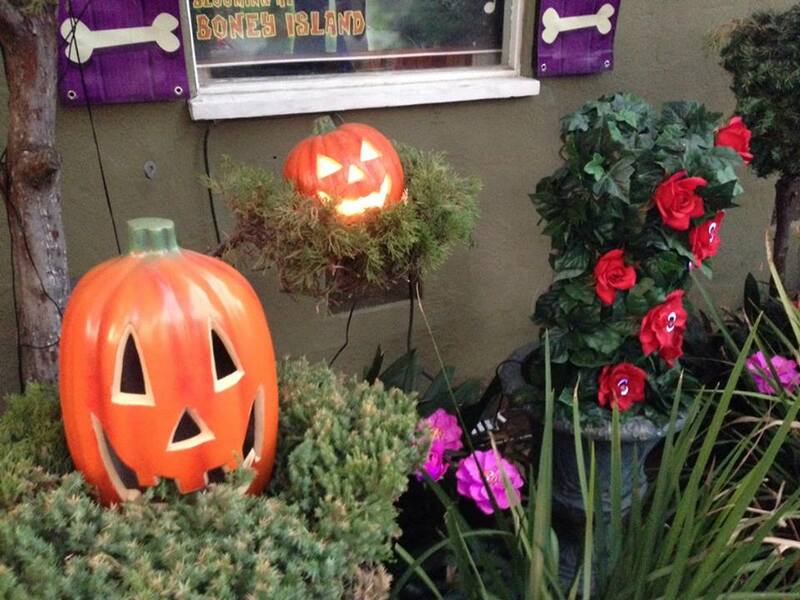 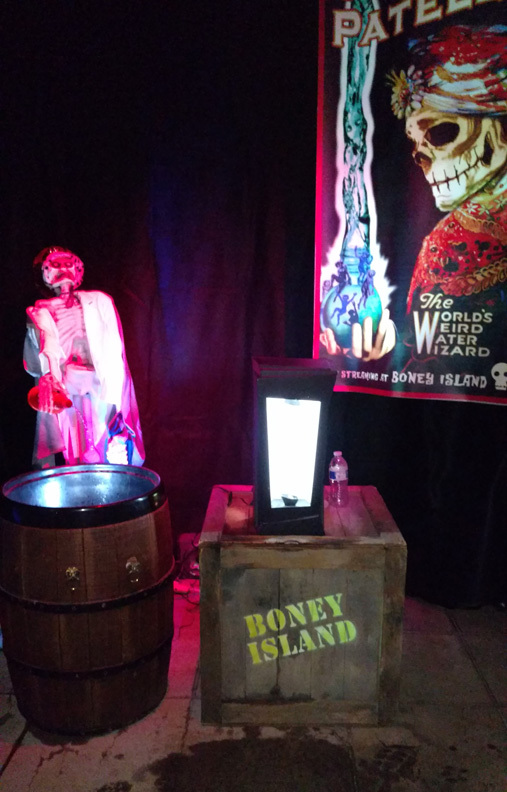 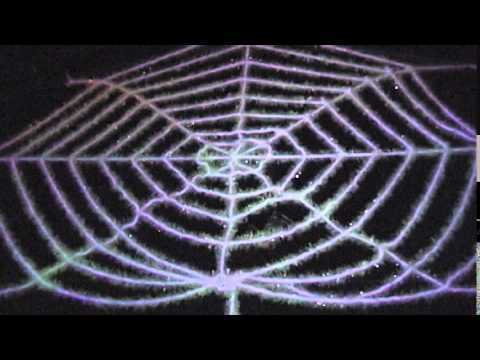 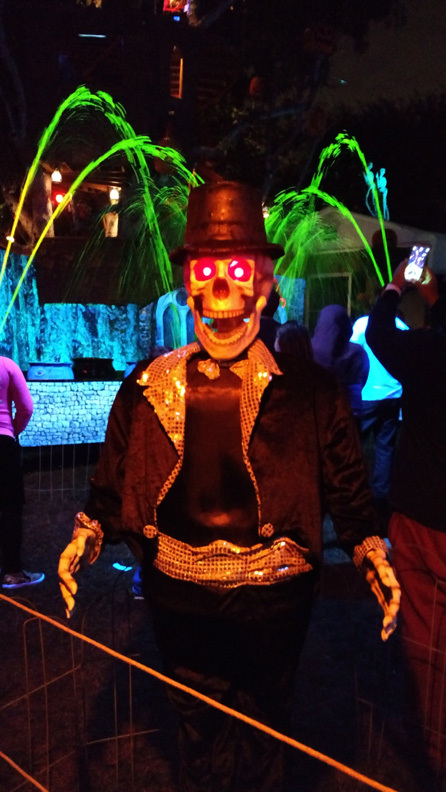 Boney Island Yard Haunt: Halloween Magic for the Whole Family! 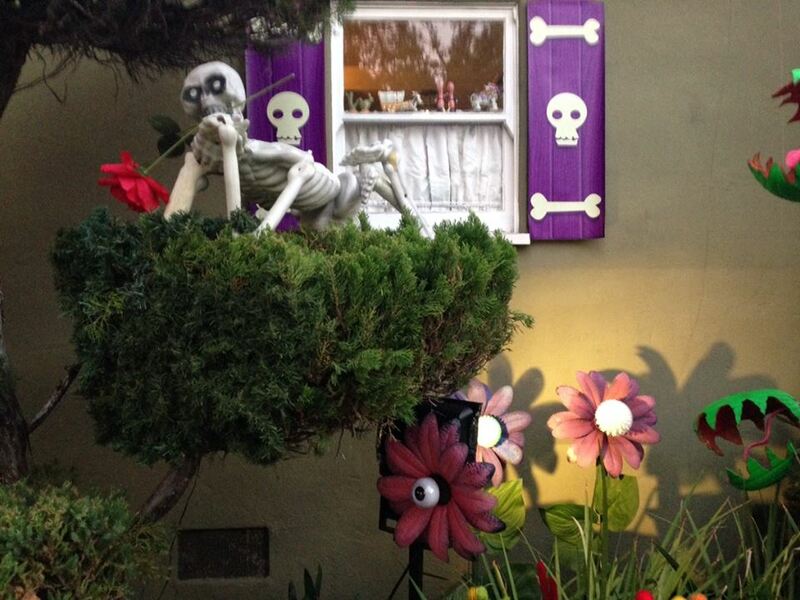 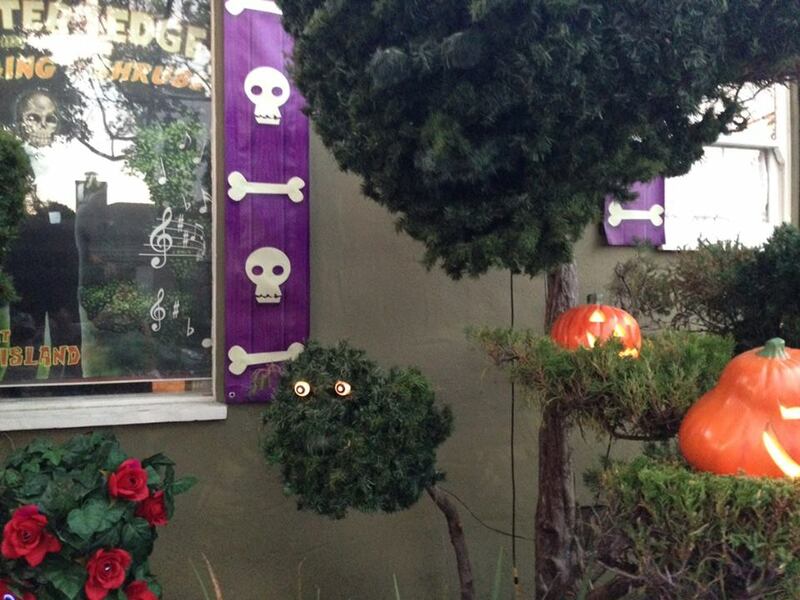 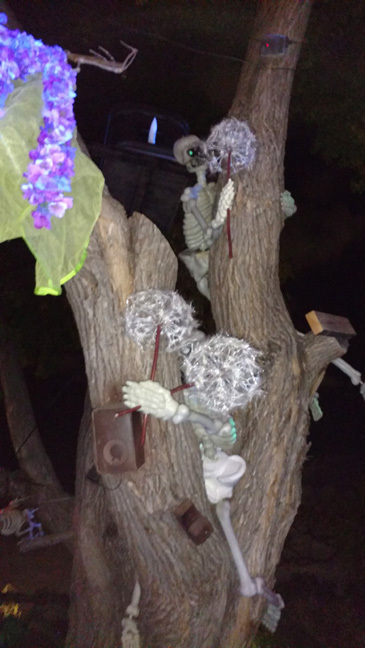 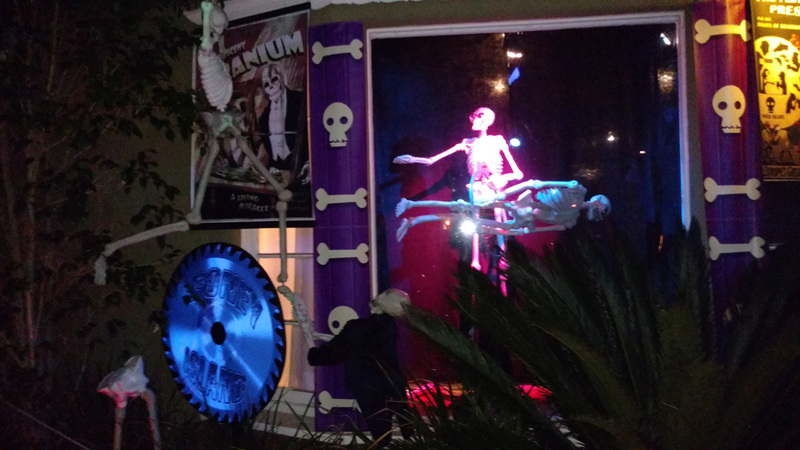 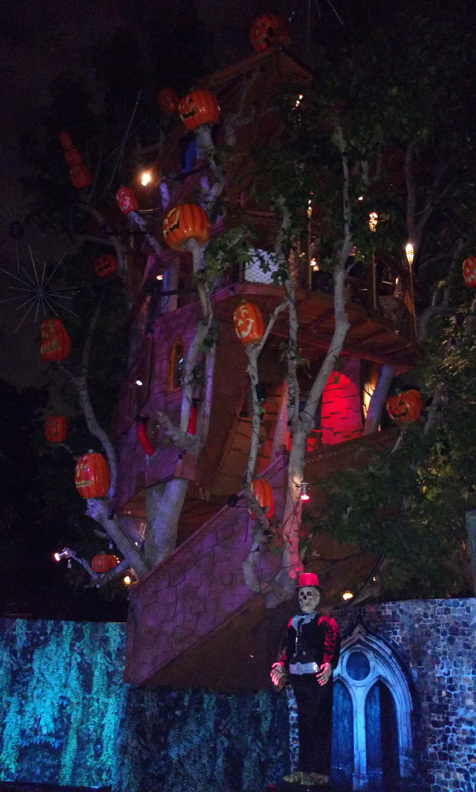 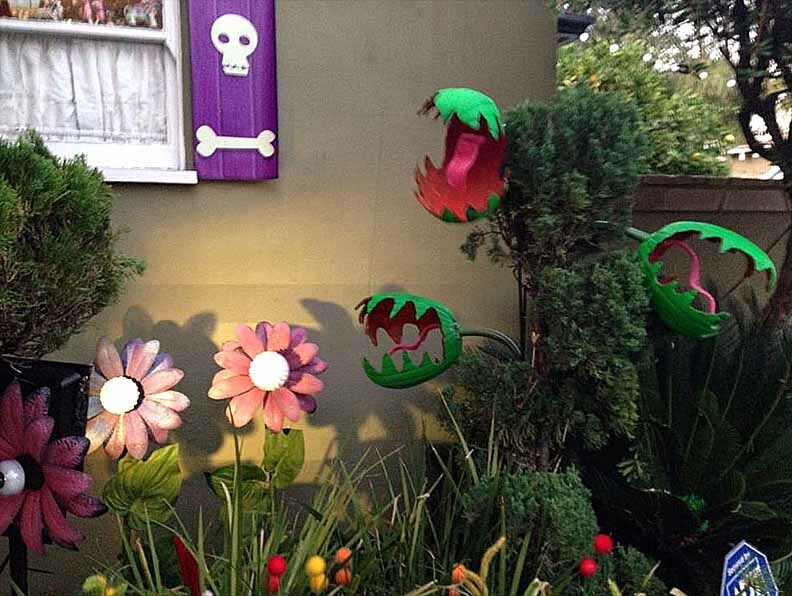 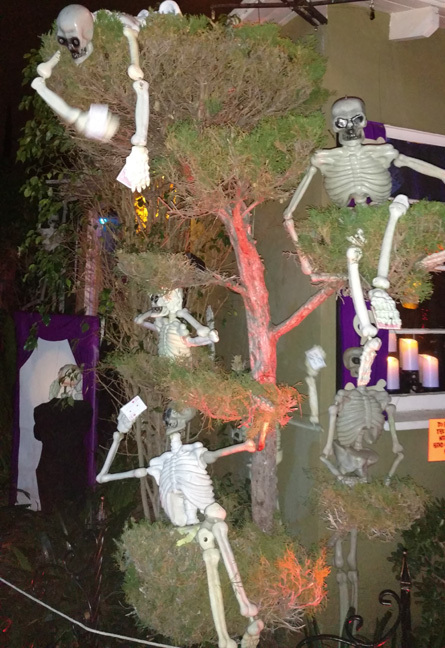 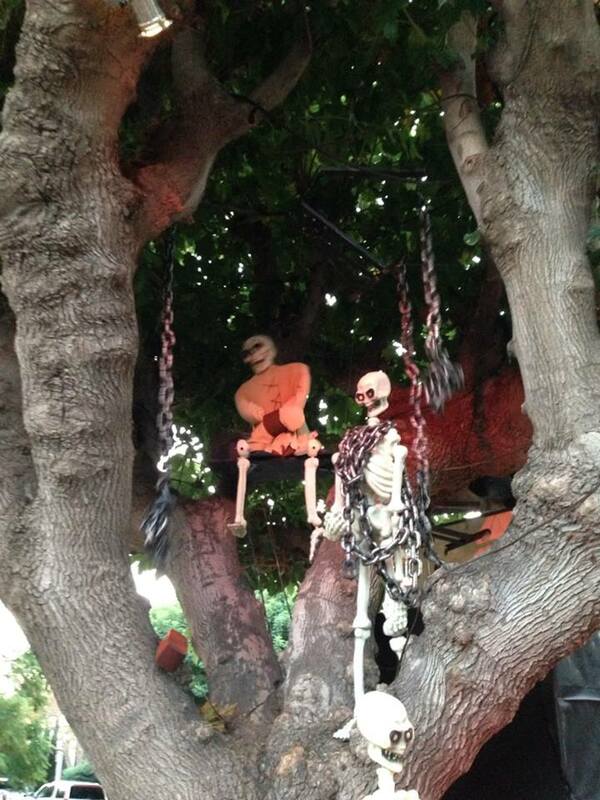 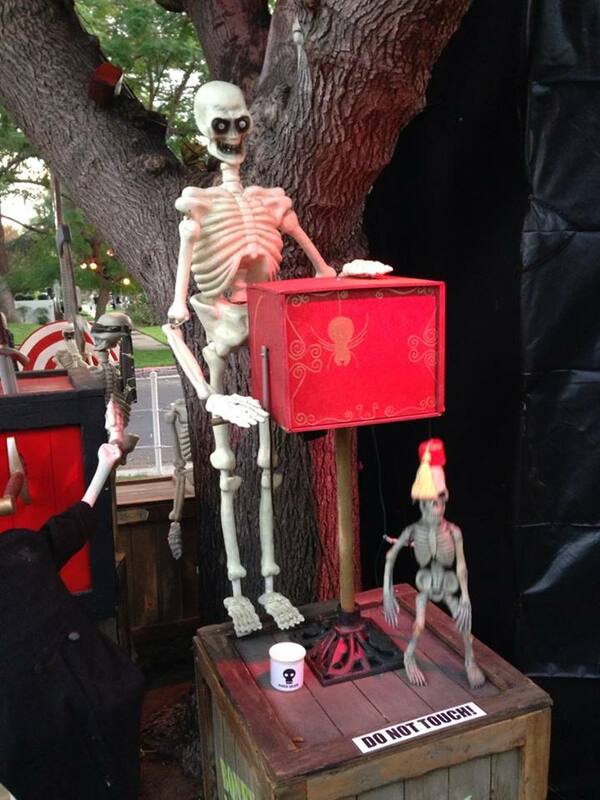 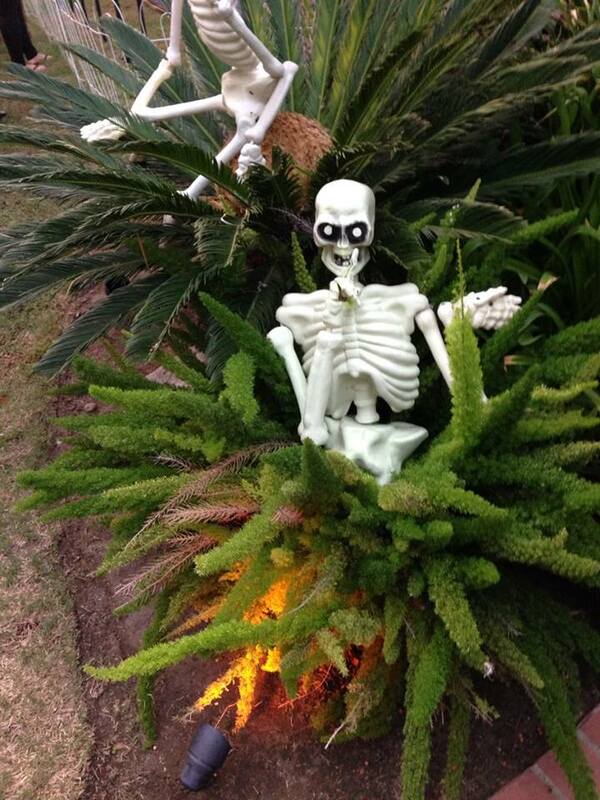 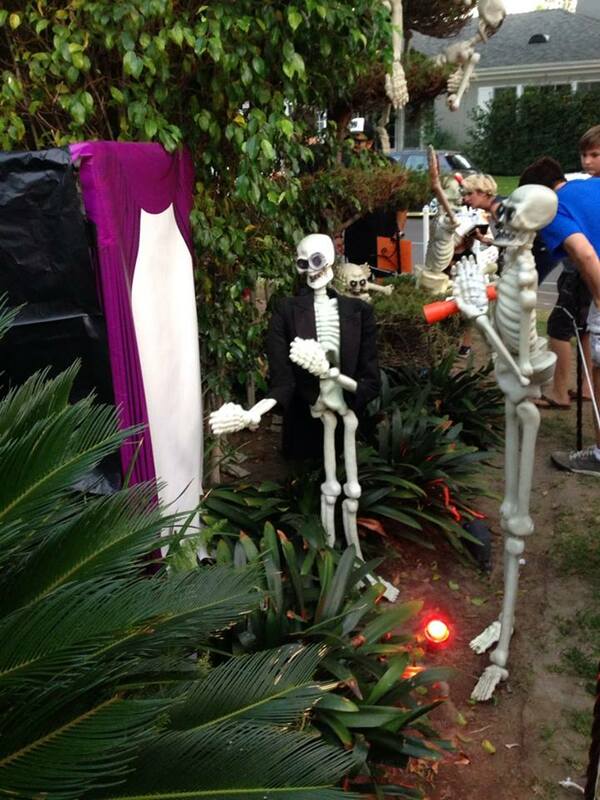 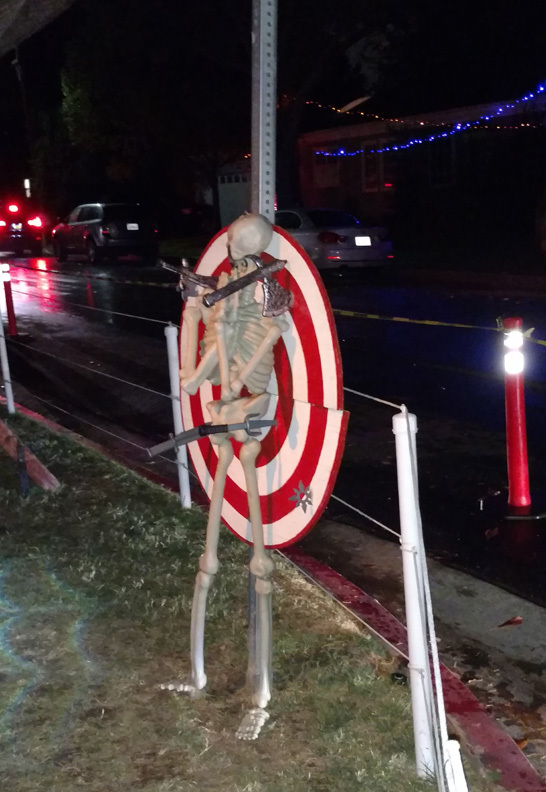 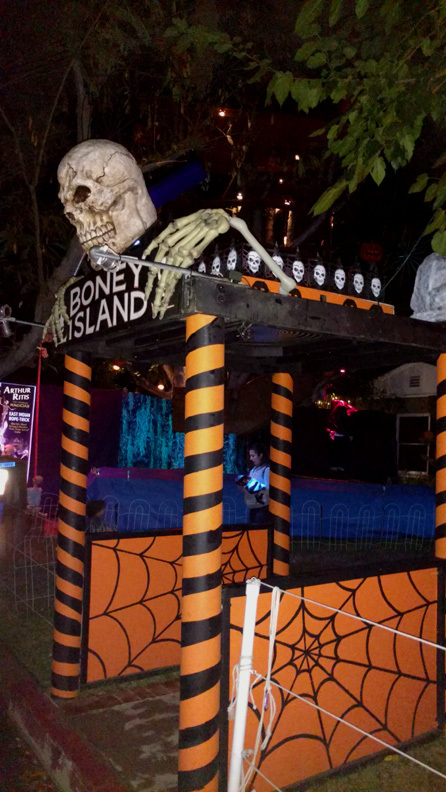 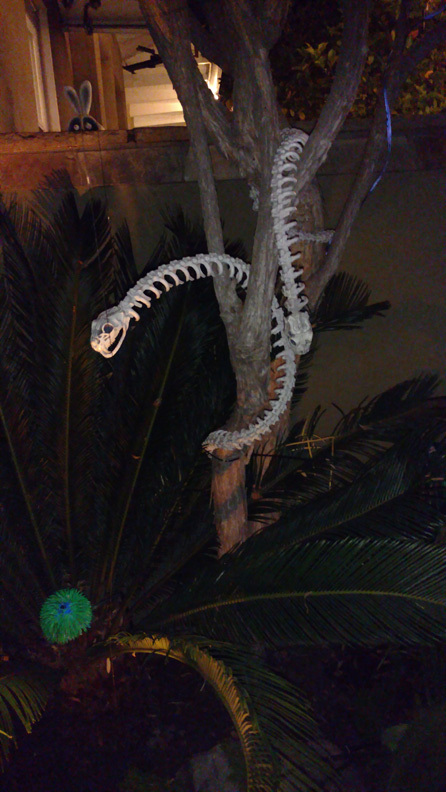 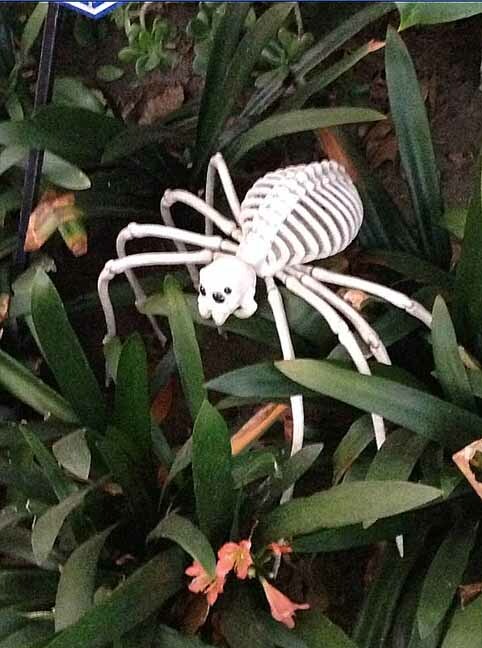 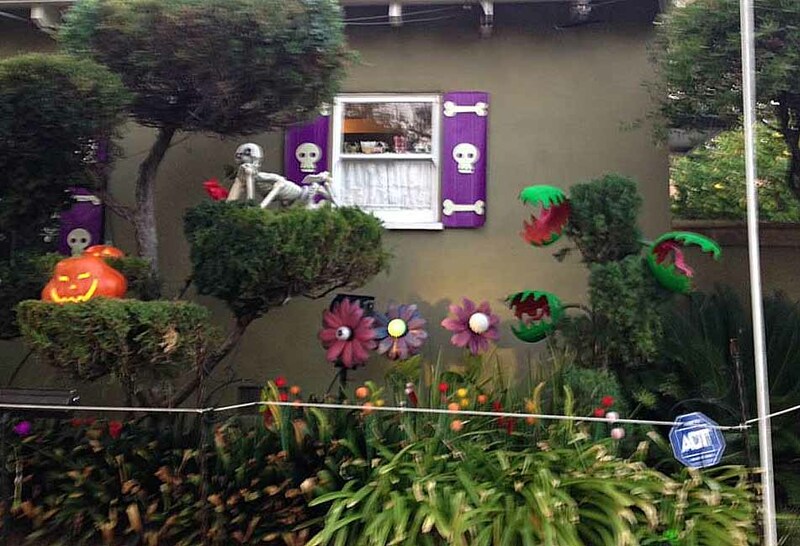 Boney Island mixed imaginative displays and clever humor to create a yard haunt equally amazing and amusing – a great way for families to celebrate Halloween in Los Angeles! 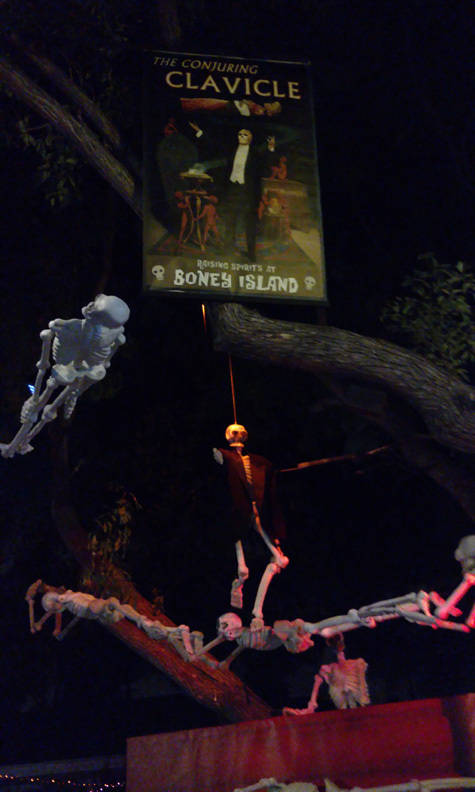 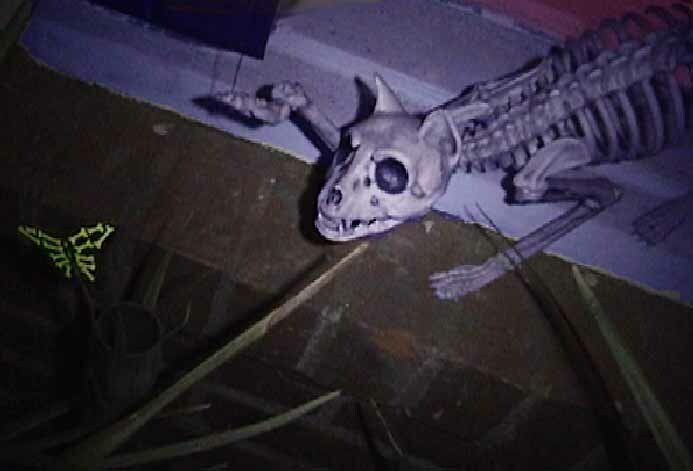 A true yard haunt – as opposed to a haunted house – Boney Island relied on decorations and displays, silly sight gags, and humorous antics in front of, around, and on top of the house. 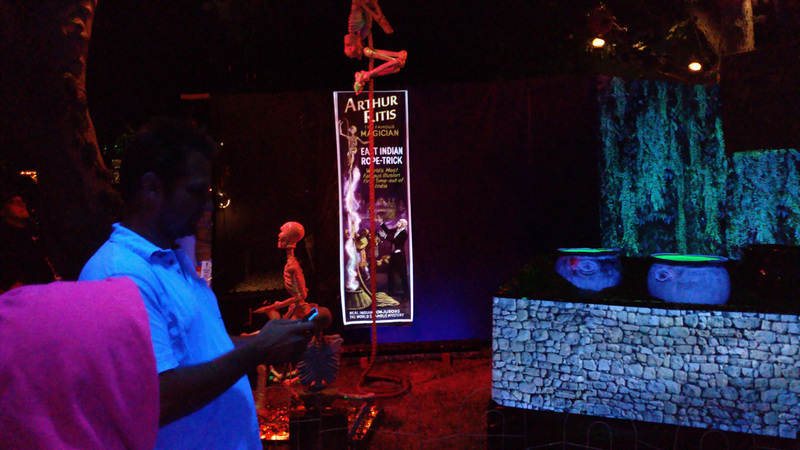 The mechanical effects were mostly low-tech, but there were some spectacular visuals, too, such as the Magic Cauldron musical show, the Spirit Box, and the anti-gravity water. 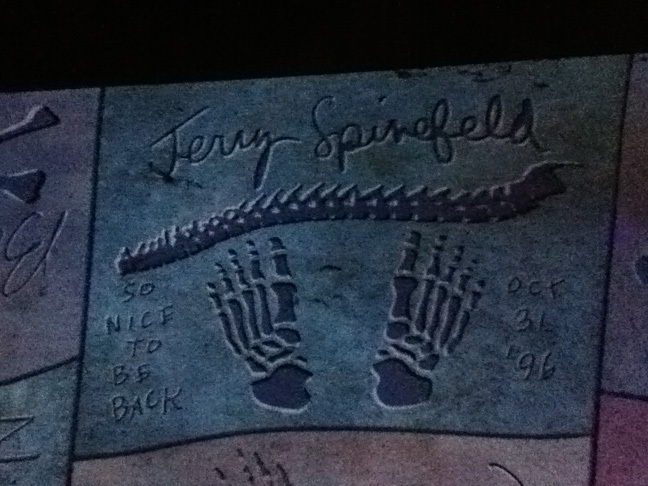 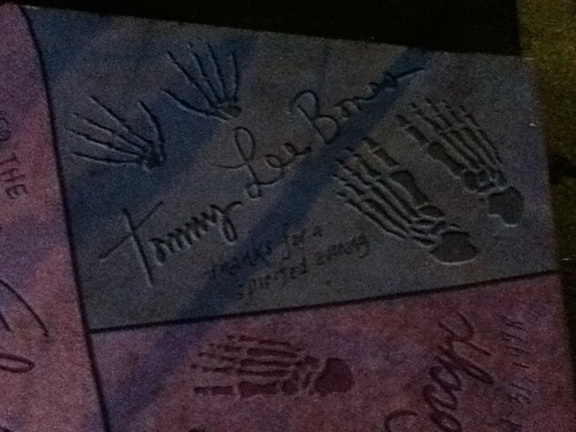 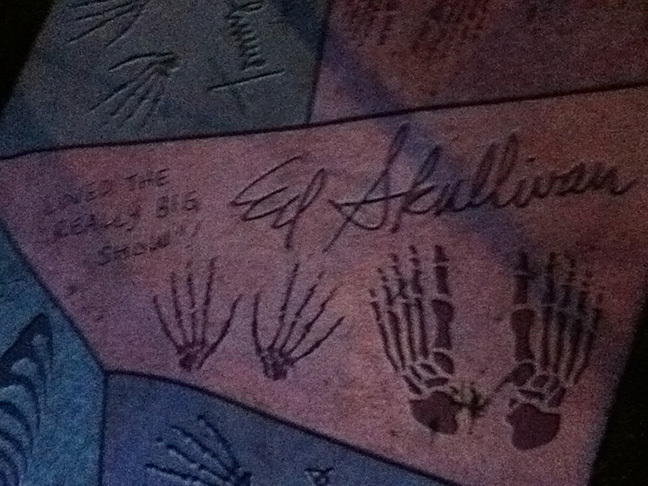 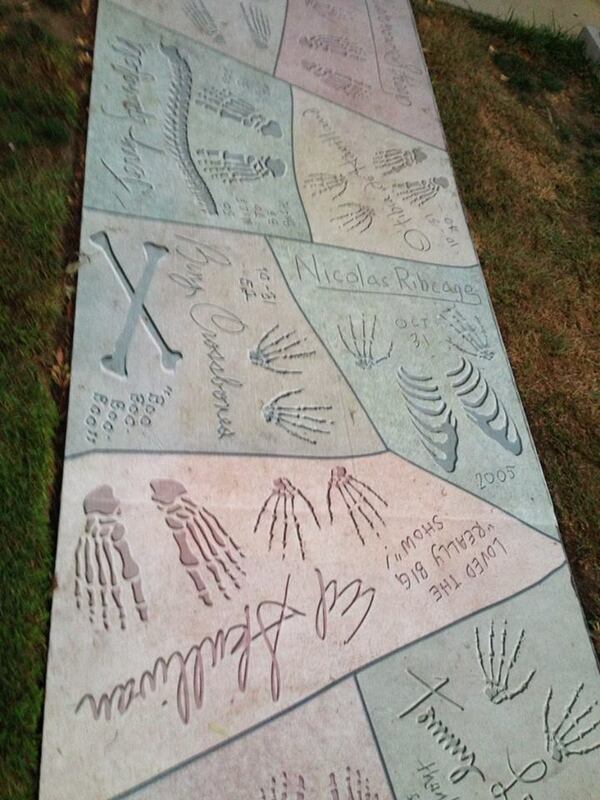 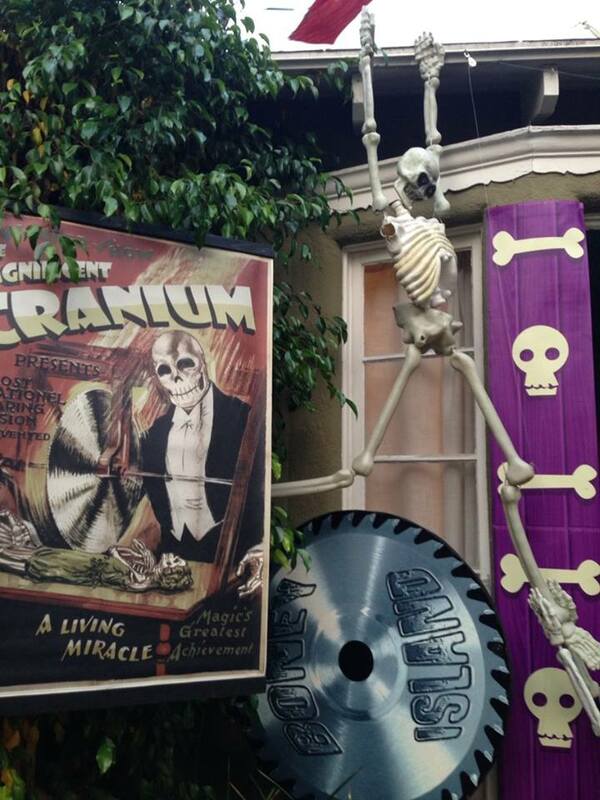 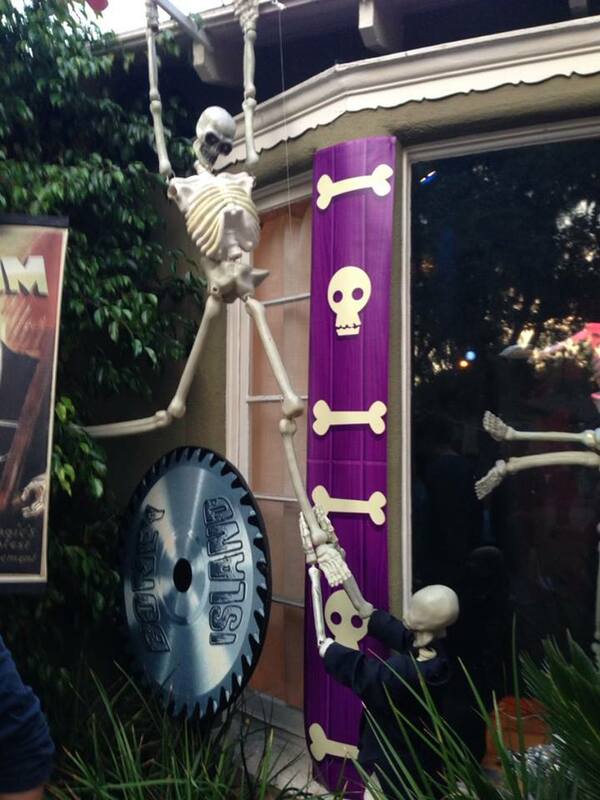 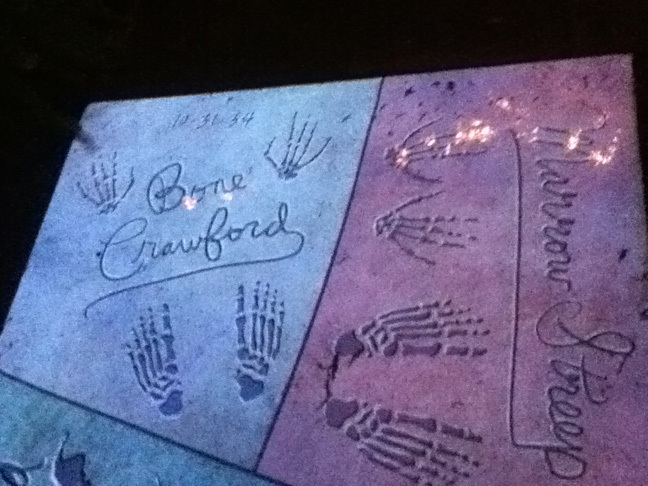 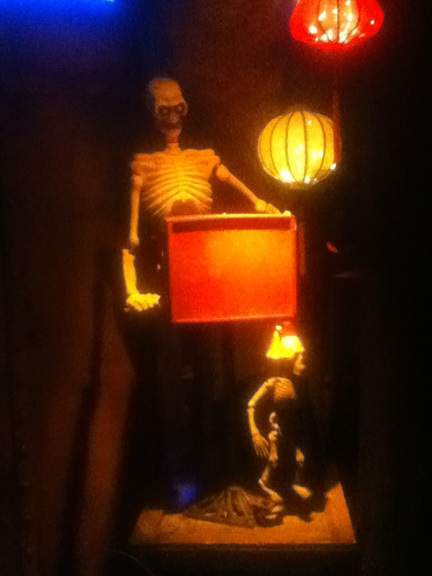 There were no actors in costumes, only mechanized props, skeletons, and special effects. 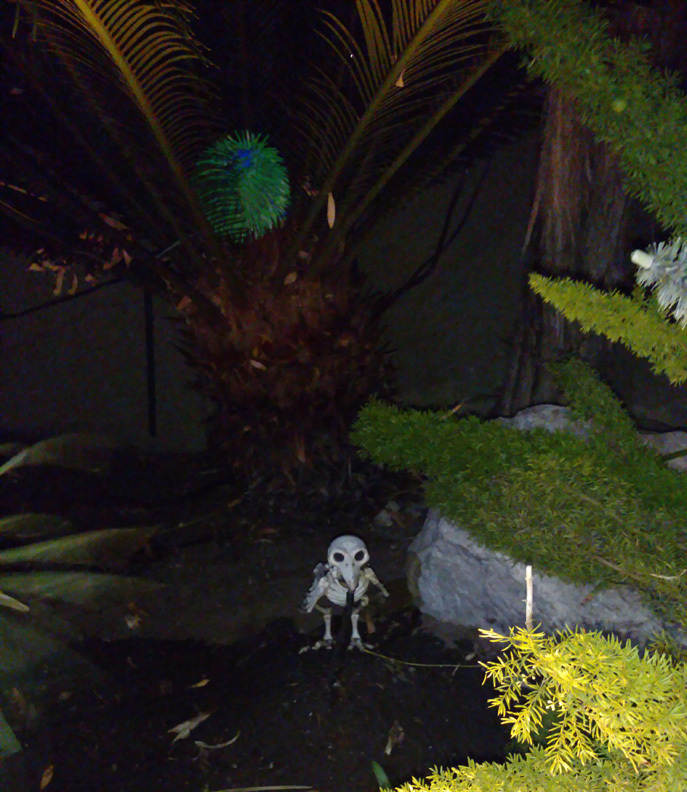 There was nothing scary. 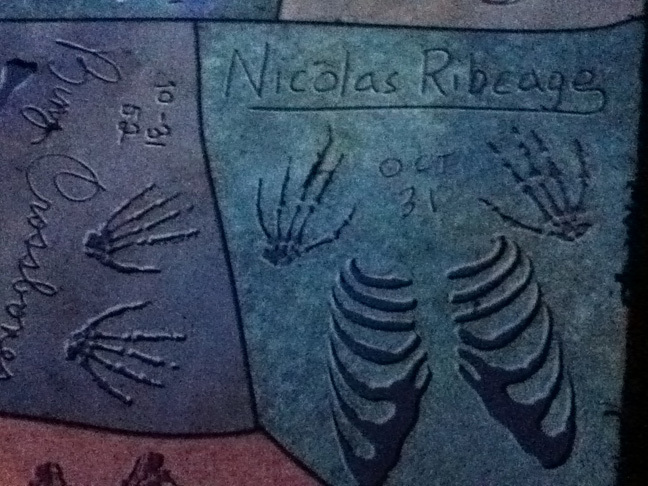 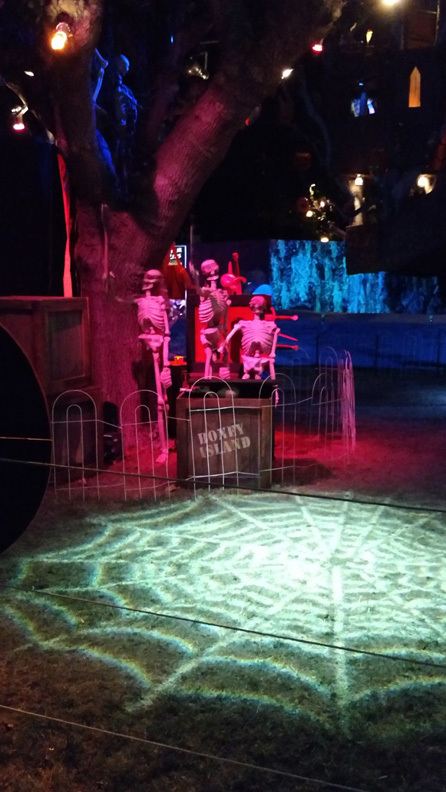 The colors and carnival music were calculated for to create a fanciful, almost Tim Burton-esque atmosphere, making this the perfect place to bring young children who might be intimidated by more adult-type haunts. 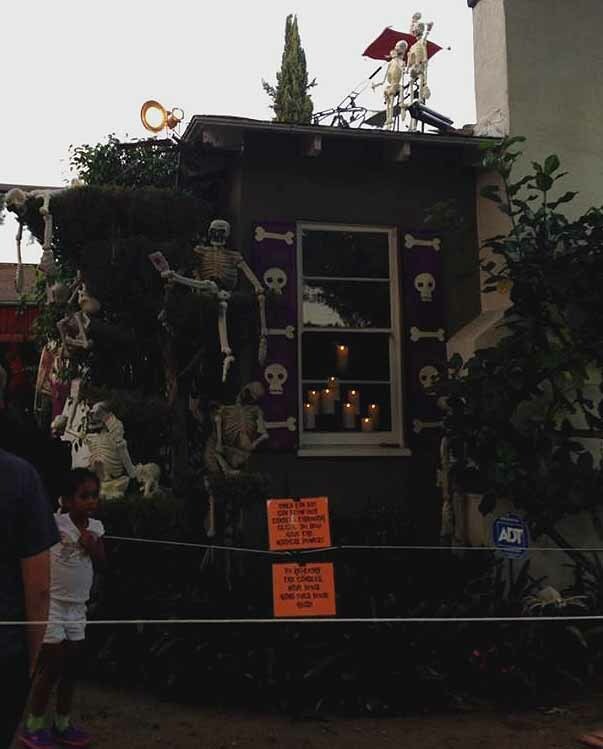 That’s not to say the appeal was solely to the young – the outrageously goofy displays were guaranteed to provide laughs for adults, too. 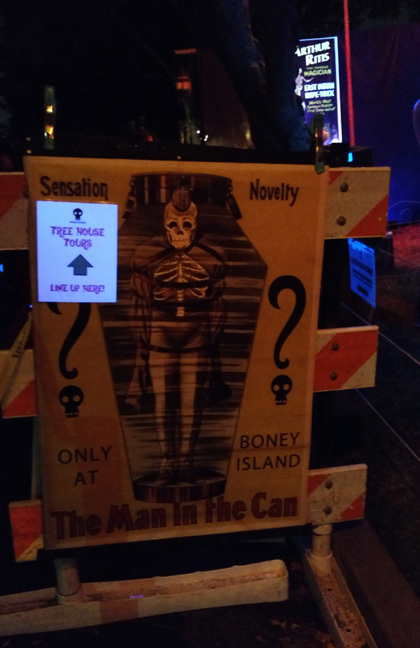 2018 UPDATE: After sitting out Halloween 2017, Boney Island returns for Halloween 2018 in a new location: in Griffith Park, near the Los Angeles Live Steamers Ghost Train. 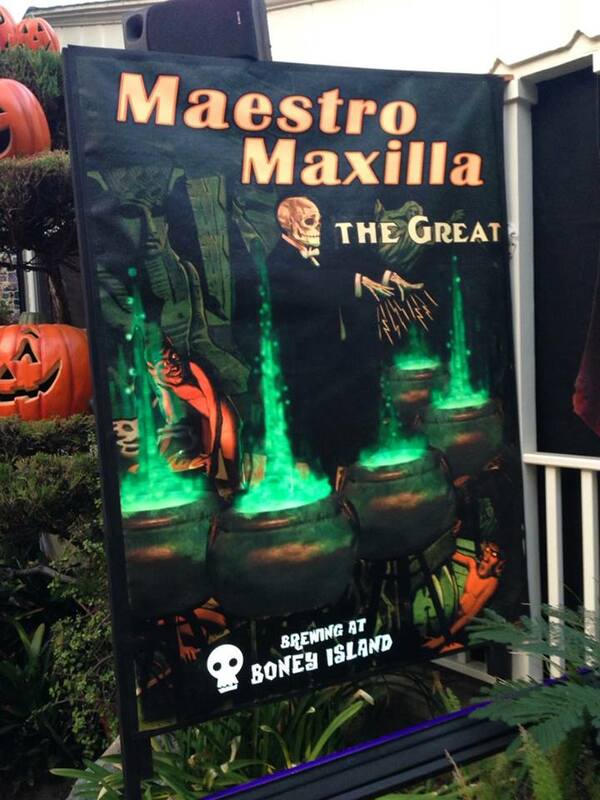 The two attractions will be separately ticketed, with different but overlapping schedules. 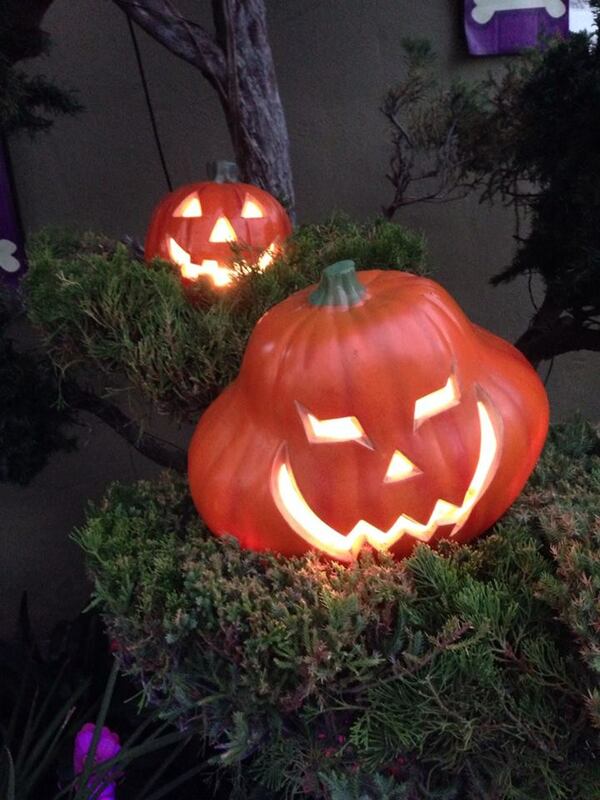 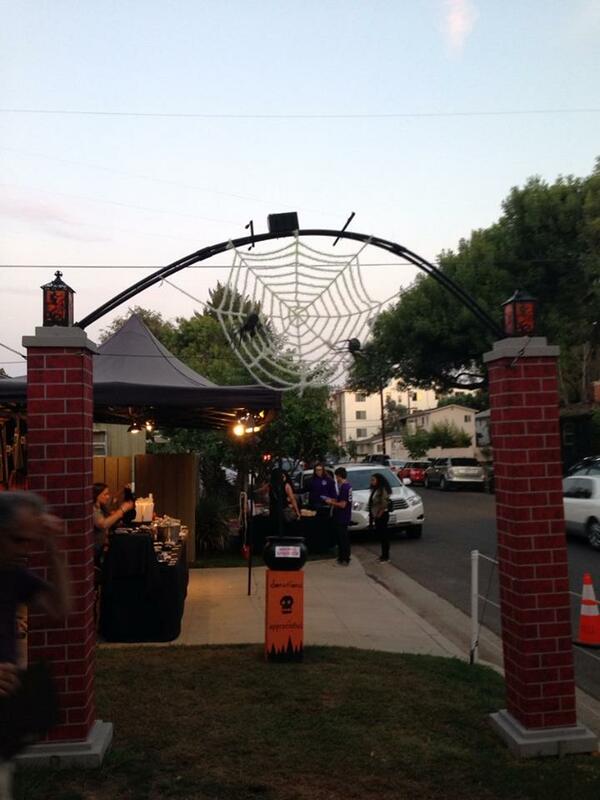 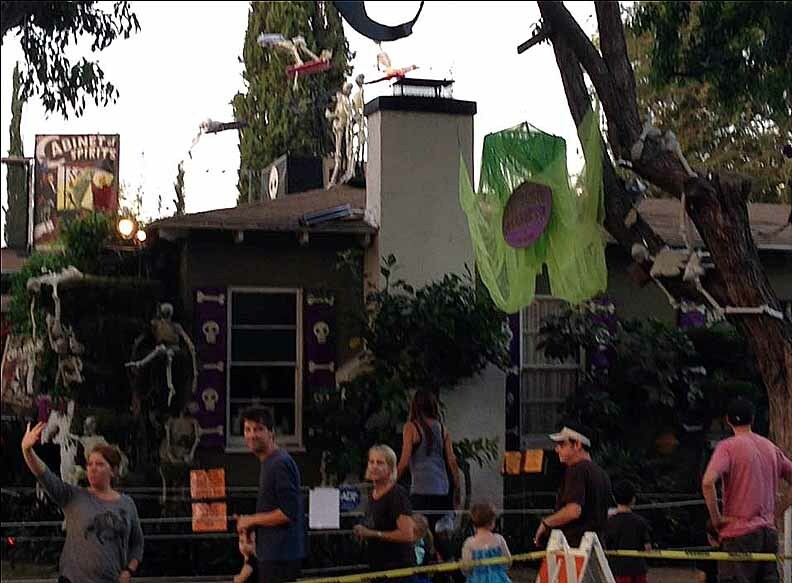 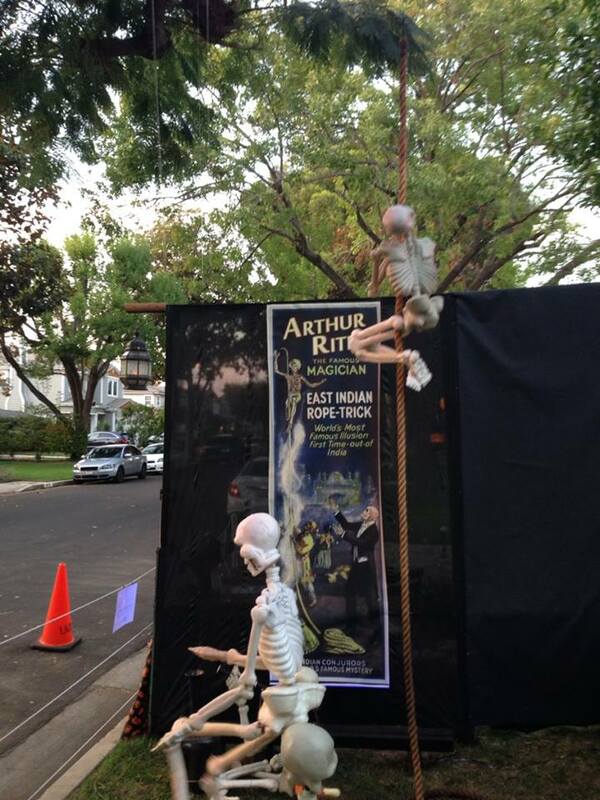 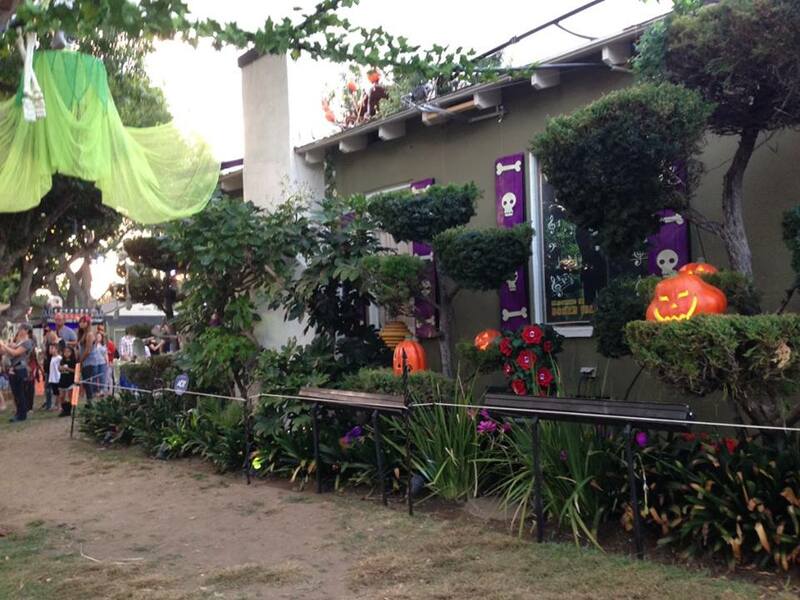 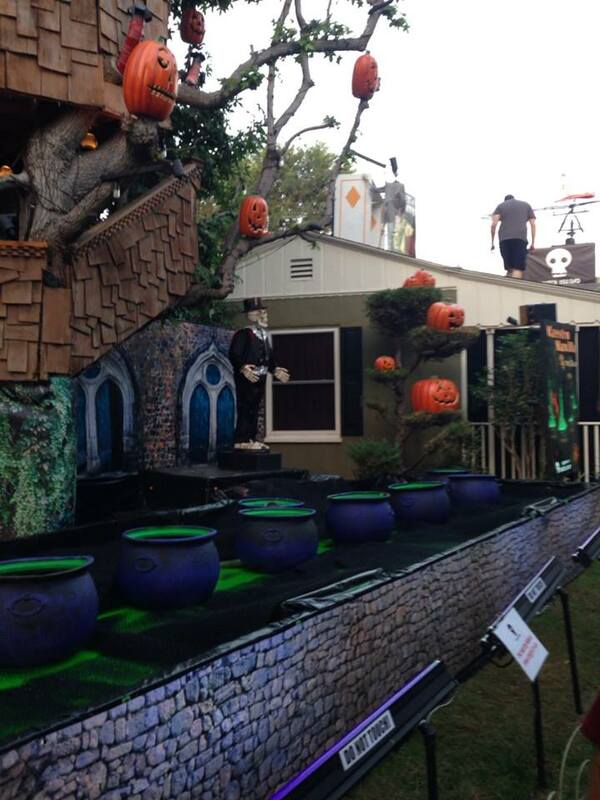 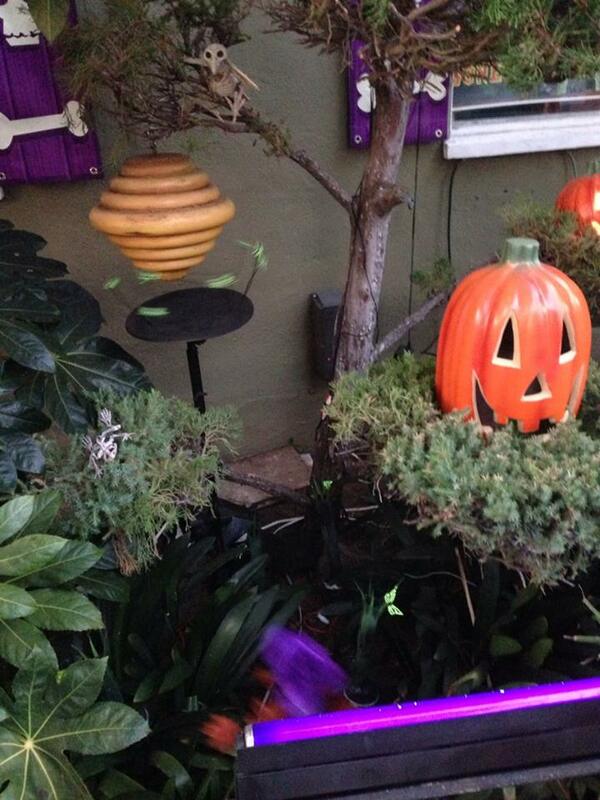 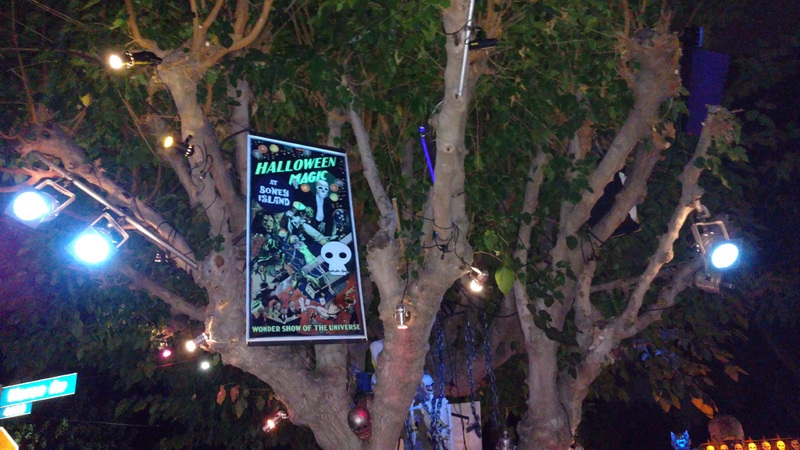 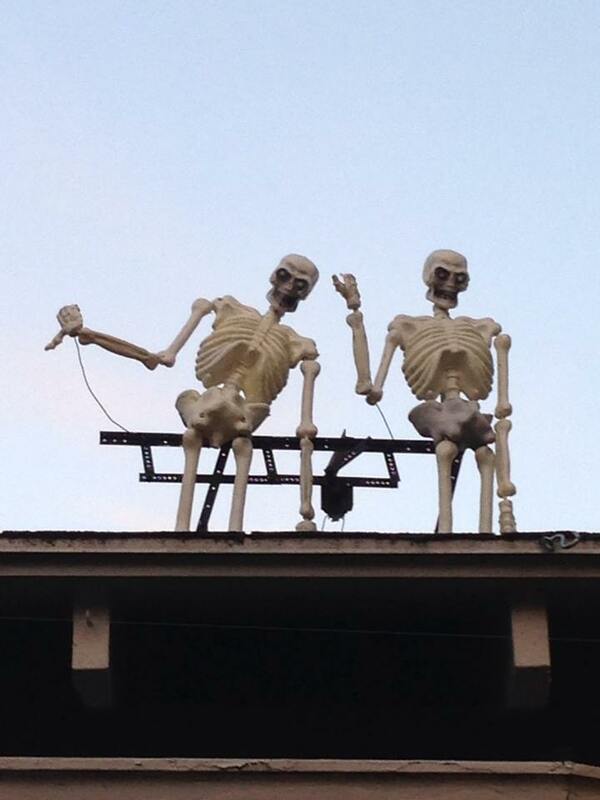 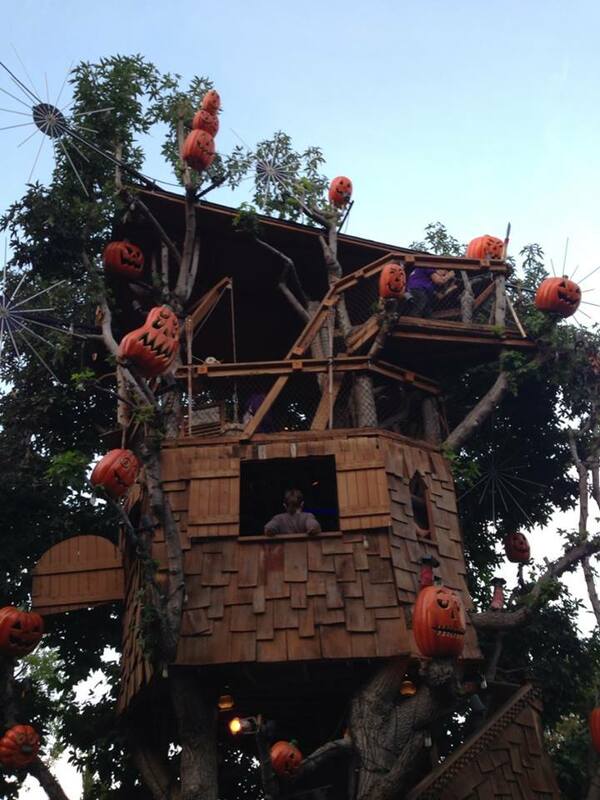 Beginning in 1997, this unique amateur yard haunt entertained trick-or-treaters for ten years, earning a reputations as one of the best family-oriented Halloween events in Los Angeles. 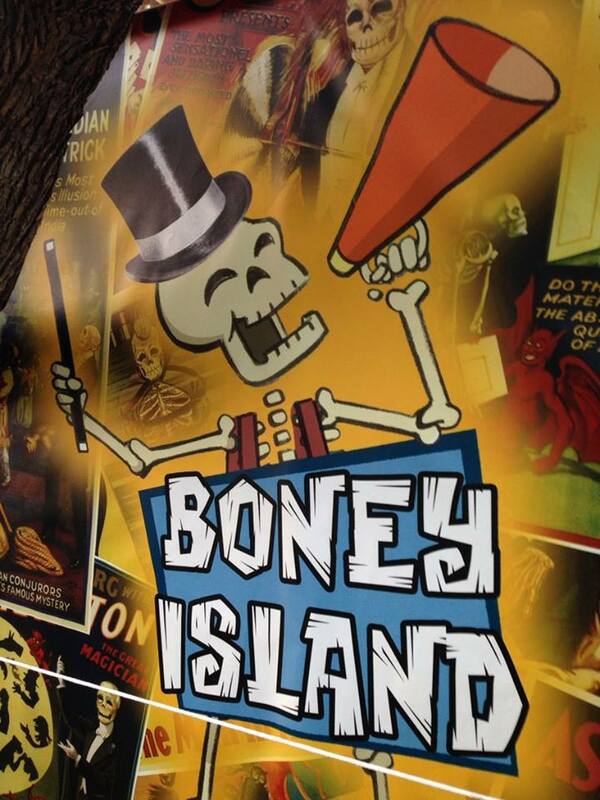 Billing itself as the "world's only skeleton carnival," Boney Island offered a Halloween version of a Coney Island-type entertainment attraction - populated entirely by skinless skeletons! 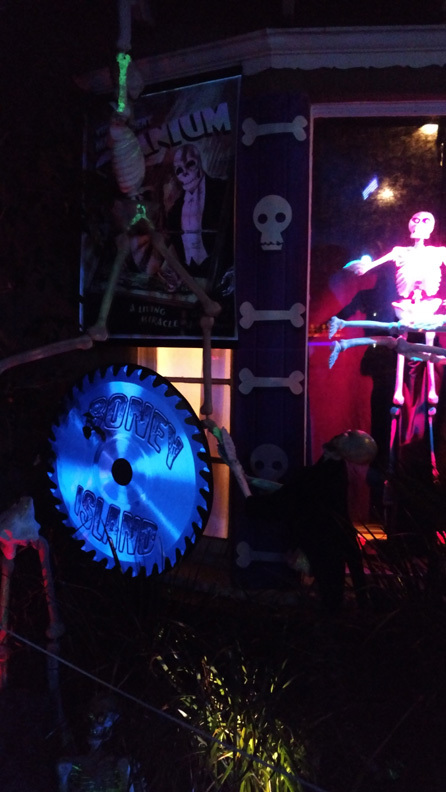 The special mechanical effects (mostly wires pulled by motors) were proudly low-tech, but that detracted from the enterainment value not one boney little bit. 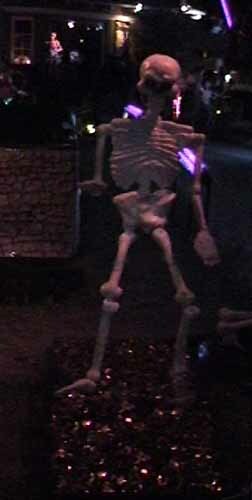 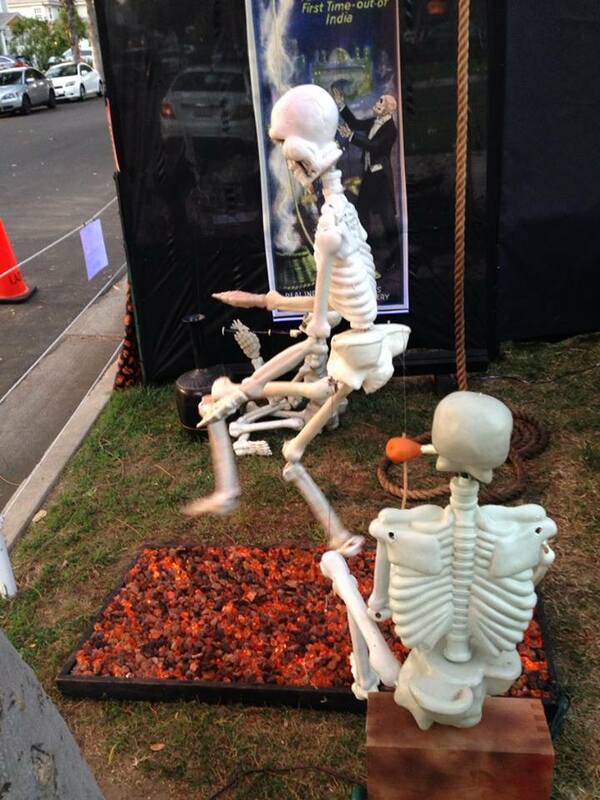 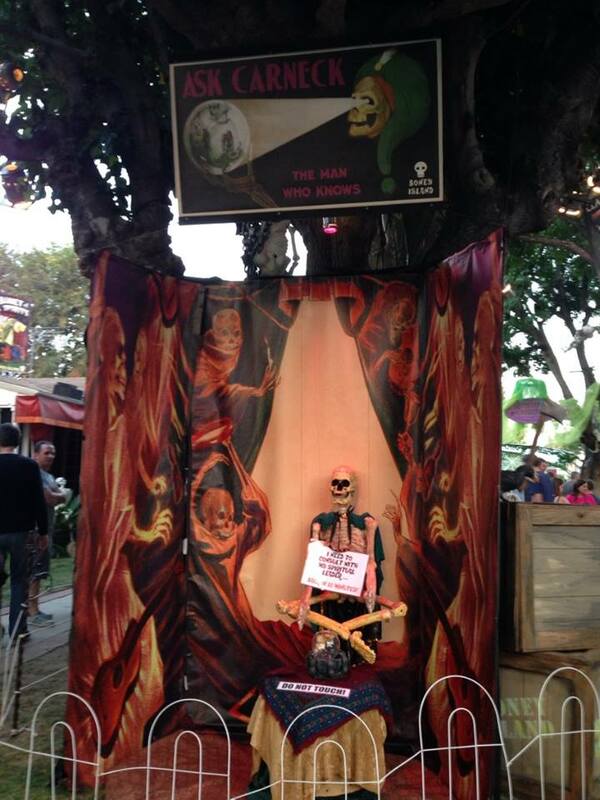 You could laugh as the skeletons fished in the "Trick or Trout" booth! 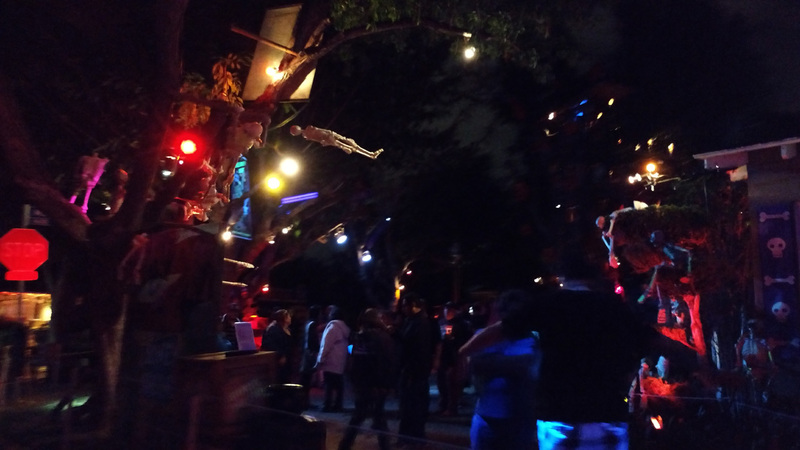 Thrill as they swung clubs at flapping flying mammals in the "Batting Cage"! 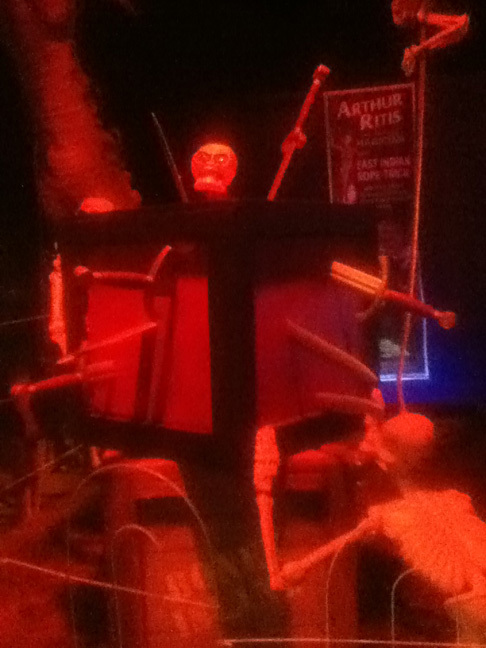 Or gag at the "Rotten Candy" machine filled with spiders! 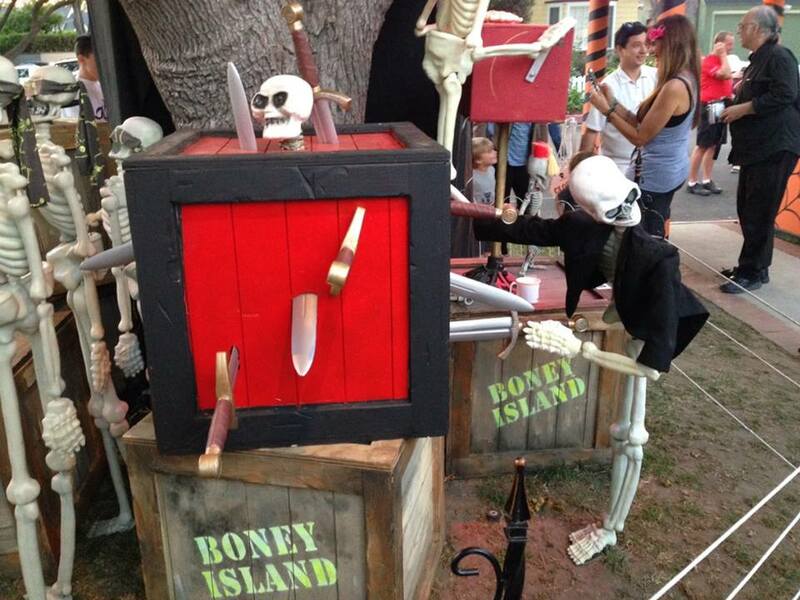 Halloween 2007 marked the 10th and last year of Boney Island in its original form. 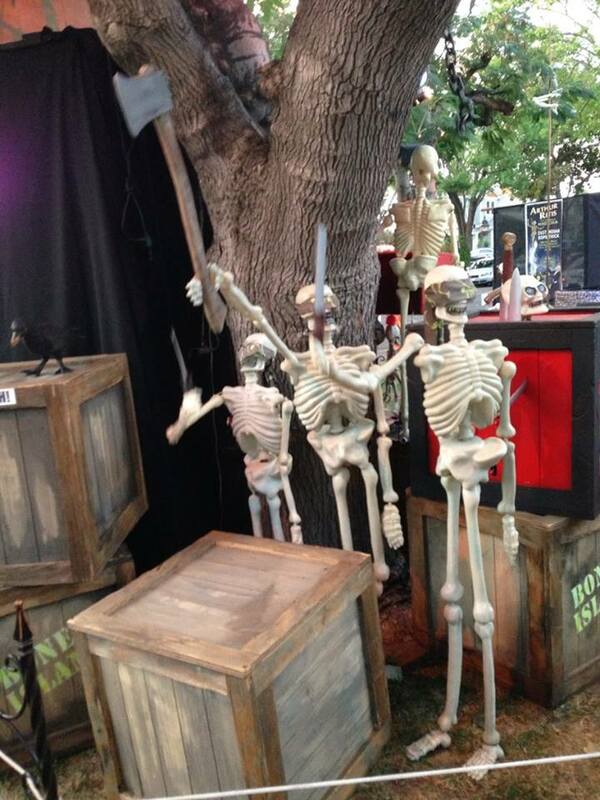 Many of the old props were auctioned off; some of them showed up at a new home in Van Nuys. 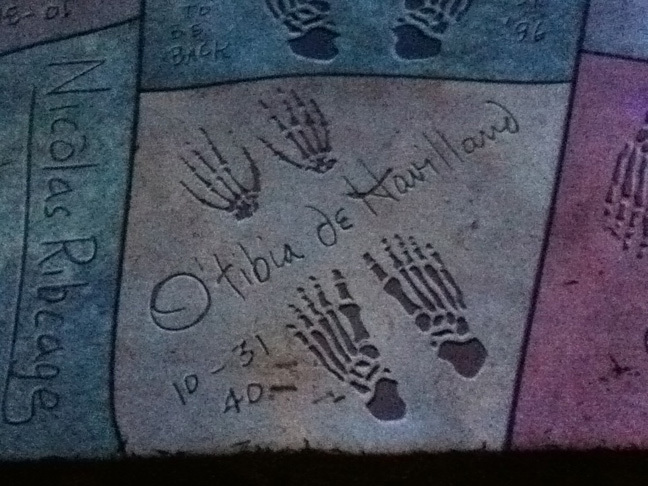 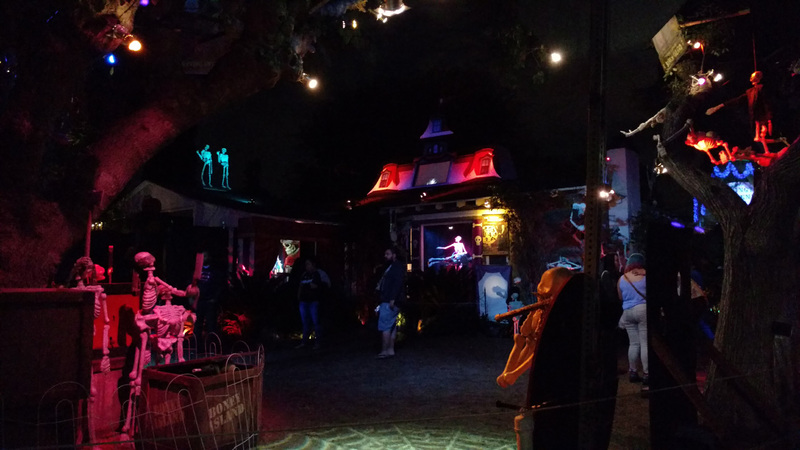 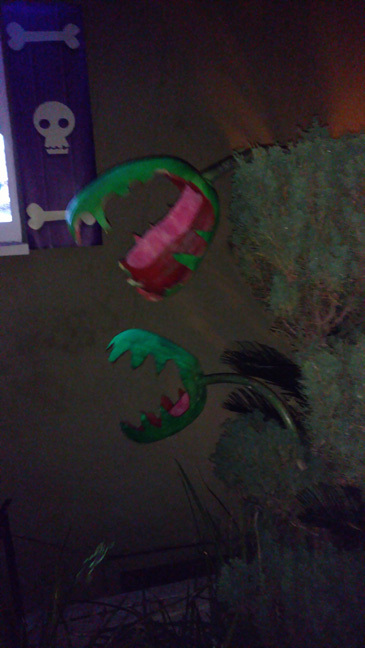 Although was nice to see a portion of the fabulous yard haunt live on, the new location was a pale shadow of the old - more a skeleton party than a skeleton carnival. 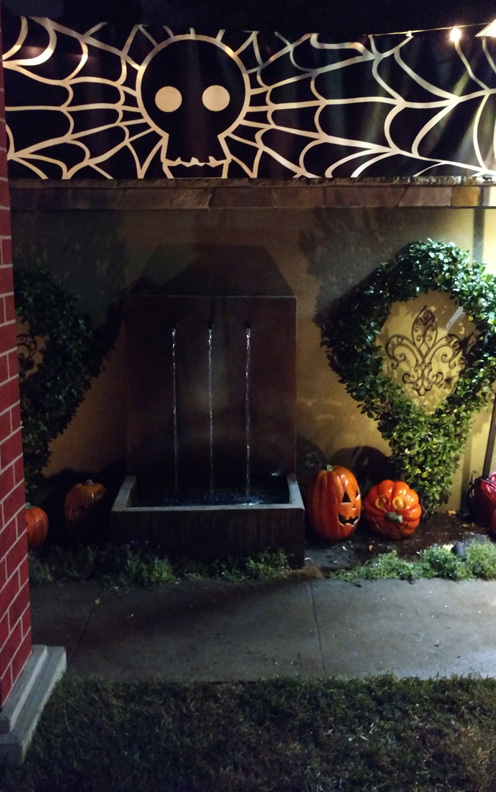 If you lived in the area, it might have been worth walking by for a look, but we would not recommend making a special trip. 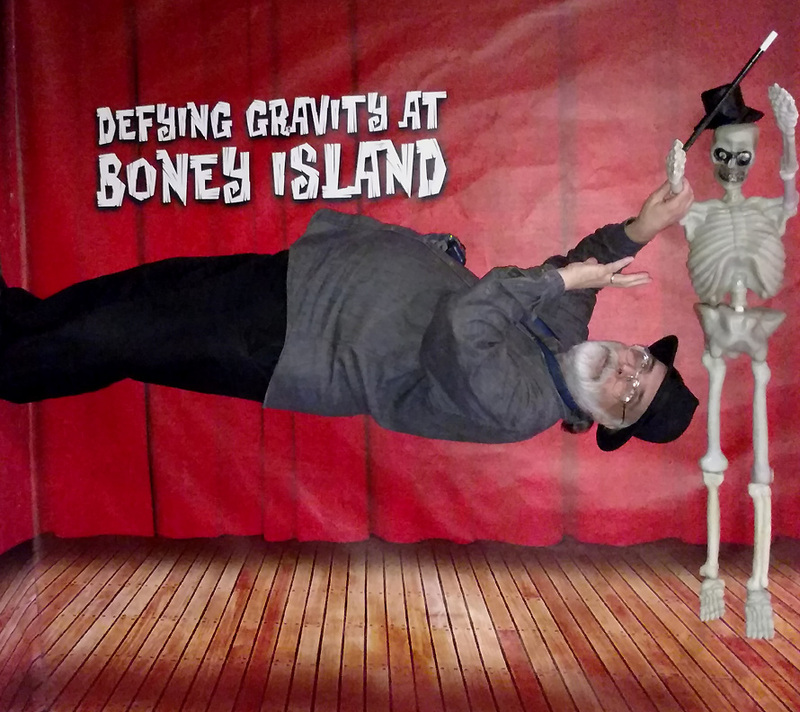 Fortunately, after a three-year hiatus, Rick Polizzi (a producer of THE SIMPSONS) resurrected a new version of Boney Island in 2011. 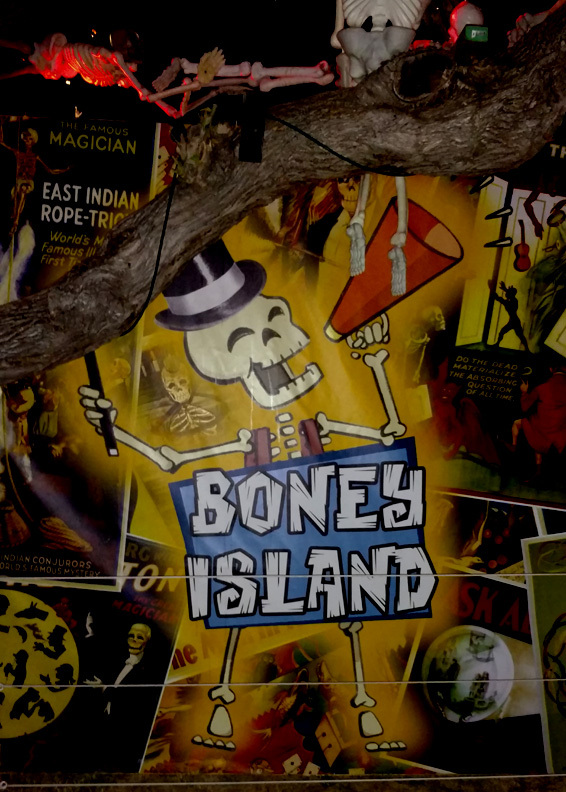 For this incarnation, Boney Island was re-imagined as a "Halloween Magic Show," featuring spooky prestidigitatosr Maestro Maxilla and the Conjuring Clavicle. 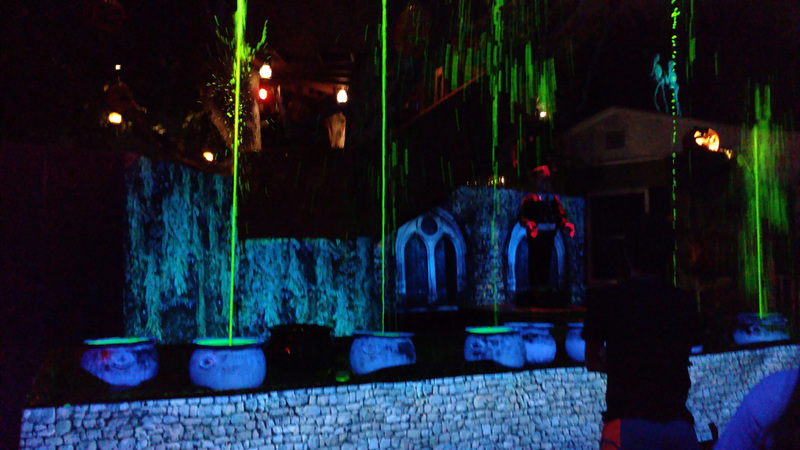 The highlight was a colorfully lit water-fountain show, set to music. 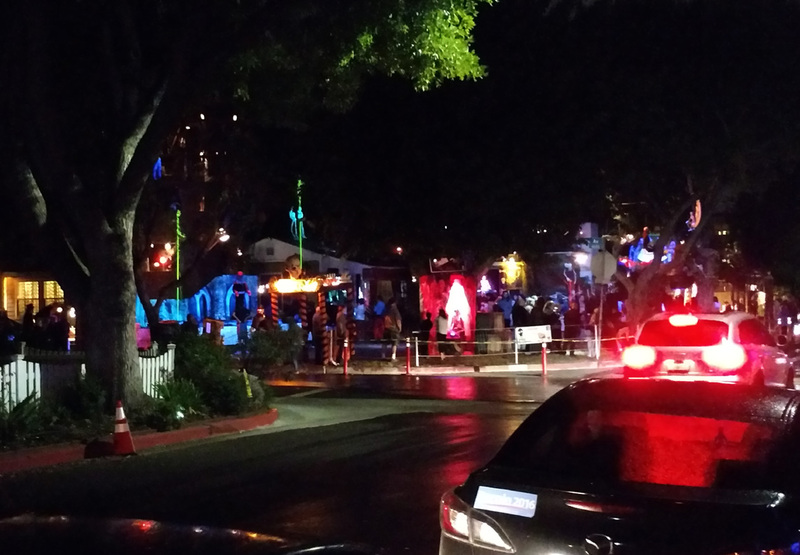 "In light of events our world has been experiencing, keeping the public safe from harm in an outdoor setting has become stricter and cost prohibitive with permit fees, road closures, and police protection. 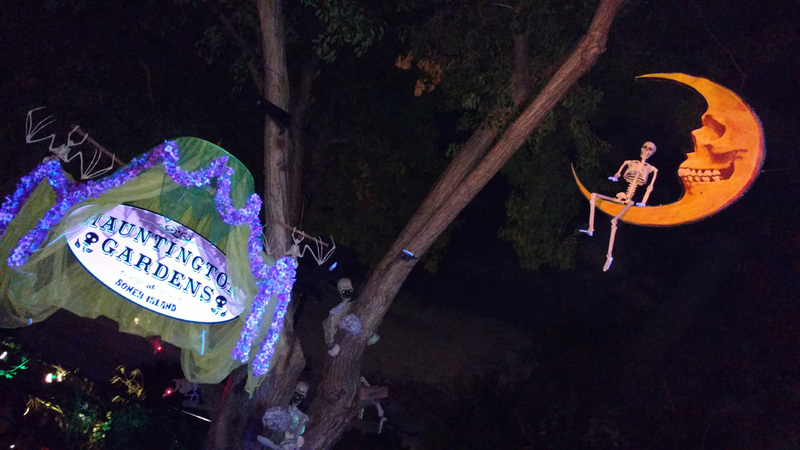 With the city's new requirements, costs could reach up to $100,000. 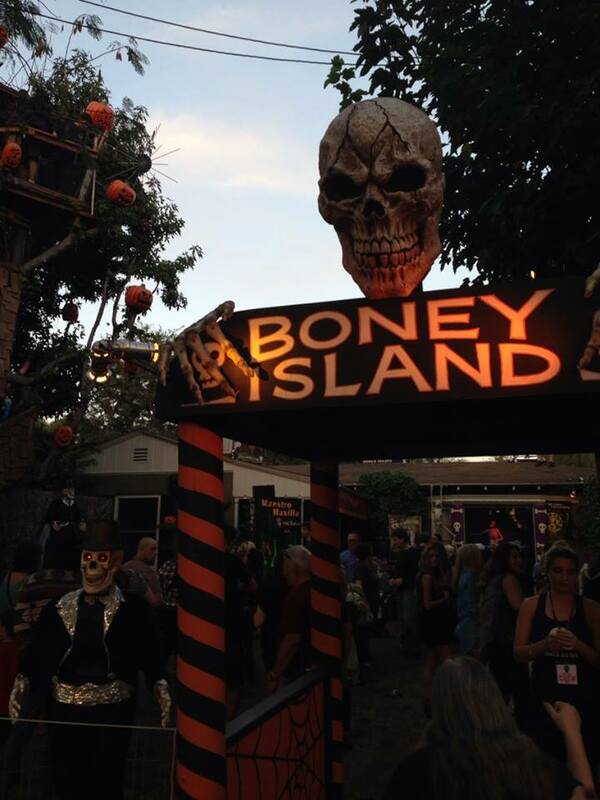 For a neighborhood event like Boney Island, it is too far out of our reach and therefore, we have no other option than to close our gates for good." 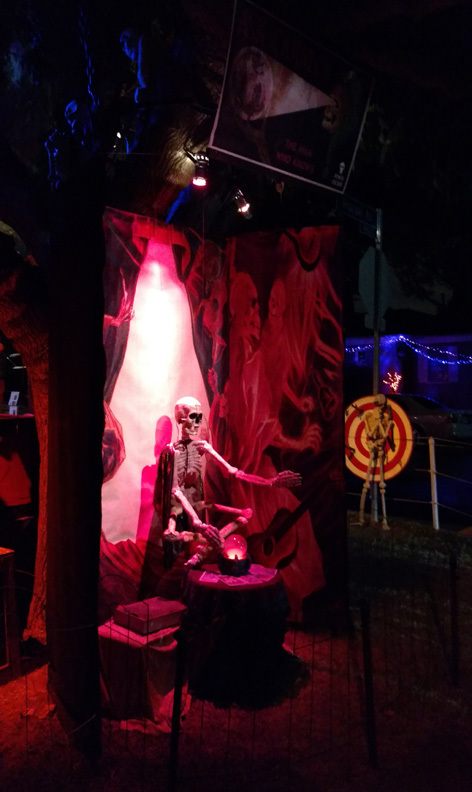 Fortunately, the haunt has been resurrected for Halloween 2018.